On December 28, 2016, Velum, Ltd. applied for registration of the US service mark on the Laser starburst design. It has been approved and was published for opposition on May 2, 2017. According to the US Trademark Office, "Any party who believes it will be damaged by the registration of the mark may file a notice of opposition (or extension of time therefor) with the Trademark Trial and Appeal Board. If no party files an opposition or extension request within thirty (30) days after the publication date, then eleven (11) weeks after the publication date a certificate of registration should issue." Karaya (Jersey) Limited and Velum, Ltd. are the most recent owners of the trademarks for the word LASER as well as the Laser starburst design. That right has historically been limited to the use of the mark in connection with goods, like sailboats, etc. They never acquired the right to use the mark in connection with the provision of services, like running regattas. Or more specifically, the exclusive right to use the mark in connection with organizing, conducting and operating sailing tournamements. As we all know, that right has historically been assumed to be owned by the ILCA and, by extension, the members of the ILCA. So what happens if Mr. Farzad Rastegar (the man behind the shell companies) successfully obtains the exclusive right to use the Laser mark in connection with running regattas? We can only speculate. He is a businessman after all and not a sailor. I would assume he is obtaining the mark for the purpose of making money. He already uses the offshore companies to license the use of the mark to Laser Performance, then shifts that income stream offshore for tax purposes. Being able to collect licensing fees from the ILCA, or its members, every time they have a Laser regatta seems like an income stream to me and would seem a logical conclusion to draw as to his intent. Of course, he might be of a more benevolent mind and he might just be trying to secure the mark to make sure no one can come along and hold the ILCA hostage while demanding they change fundamental rules to suit one side over another, or that they relinquish their patents on the Mark II sail, or that all big events be run in one builder's territory and and not another, or some other such mischief. So, what can you, the ILCA, members of the ILCA, or PSA do about this? If ever there was a time to pay an attorney to protect your rights, it is now. 1. Look at the specimen they filed as proof of their use of the mark. 2. Look up the term Collective Trademark because the ILCA and, by extension, its members, would appear to possibly have a priority claim of use of the mark in connection with regattas. A win of a collective trademark for the ILCA might also lead to being able to unravel some of the other LASER trademark registrations in the US. 3. Look at the ownership chain of title for the existing LASER trademarks. There are some breaks and the true owner may not be Velum at all. There may even be a possibility to claim that the LASER mark has effectively been abandoned for years. An opposition filed by the ILCA to this latest registration attempt might turn out to uncover a bigger problem and ultimately shift ownership of all the LASER marks in the US to the ILCA. 4. Look at Velum's previous attempts to register the service mark in the US and at Bruce Kirby's oppositions to the registrations. One of the oppositions is still pending which I assume prompted them to refile this recent application using a different specimen, trying a slightly different spin. Velum argues that it has already licensed the trademark to the ILCA and then extensively detailed the ILCA's control over the entire Laser game. Is there such a license? 5. Oh, and PSA, when you look at the Kirby oppositions you will find that the US Trademark Trial and Appeal Board has already ruled that the agreement signed previously, which prevented Kirby from ever contesting the marks, does not apply to this newly claimed use of the mark for services. It's fair game. If the ILCA won't defend their right to the mark under a collective trademark or otherwise, then there may be angles PSA can exploit to claim a right in the service mark in the US. Lastly, those of you in the EU. Might already be time to bend over. The service mark in the EU was filed at the same time, has already gone through the opposition period, and a registration certificate was issued on April 12, 2017. I wonder if the ILCA has already received a cease and desist letter asking them to pay a licensing fee to run Laser regattas in the EU. Does any of this have a connection in why the charter fee is so steep for the Master Worlds in Croatia this year? Surely not. Thanks. I'd like to help but the next immediate step is unclear. Is there a form or petition one can fill out? Or perhaps a form letter that we can edit and send somewhere? I have not done any research on the requirements for filing, such as, who has standing to file. The ILCA for sure has standing and should file. I would guess that it might be possible for the members to somehow join together and file as a group (if the ILCA won't do it for us). Then there are the legal arguments that need to be made in the opposition. That really needs to be done by an attorney and I have not checked into whether or not a non-attorney is allowed to file (pro se). However, the US Trademark Office is pretty good about providing instructions, answering questions, and allowing individuals to represent themselves. All in all, the most effective means of blocking this registration is for the ILCA to file the opposition but they don't tend to want to rock the boat with Rastegar or incur legal fees. At the very least they should at least file the opposition themselves and attempt to craft some legal arguments rather than just laying down and allowing this. The TTAB works much like a regular court of law but they do most of the work so the legal expenses are far less than actually going to court and their decisions are final. This is why I love your blog. One day a fair and balanced review of the RS Aero. Next day a detailed analysis of a legal issue affecting Laser sailors. Doug and Pam - what a team! I get the easy part about sailing. Pam does the hard part that involves lots of research and analysis. It took several weeks for Pam to finish this post. In an effort to keep this short and to the point, I did not say anything about the observed restructuring Rastegar's operations have undergone since the Kirby decision came out. In addition to the December 2016 trademark filings, he also transferred ownership from Karaya (Jersey) Limited to Velum, Ltd. for most of the Laser trademarks. He has also changed legal counsel for his intellectual property. Now he is using Fortis-IP and they have changed up several things, including the address for Velum, Ltd. which if you look up on Google street view, seems to be a recycling plant in the middle of nowhere. The new IP counsel seems to hold title to that property. Maybe when I have time, I'll put up another post about the reshuffling and add some information about the 10% IRS whistleblowing reward. If all these shell companies aren't done just right, it goes from legal to illegal and anyone providing information that leads to the IRS recovering unpaid taxes, gets paid a reward of 10% of the unpaid taxes ... or something to that effect. I haven't looked at that in several years and my old brain forgets stuff these days. I don't have $400 for screwing around with Laser trademark issues. However, I certainly do have an easy to prove history of using the Laser logos and etc as a regatta host since 1984. I have never been challenged for my use to make promotional materials, t shirts, bumper stickers, media reports, or in ANY WAY told the logos and name were not mine as a Laser owner and Regatta histvto do as I please. Also, our local Fleet #22 has an official plaque issued to us inntge 1970s establishing our Austin Yacht club as a home for a fleet. It seems to me any Lawer versed in trademark permissions and usages could easily establish that at least Fred Schroth , Schroth Fiberglass, and Austin Yacht Club have had unfettered and unrestricted access to use of these logos and names for well over thirty years. It is also quite easy to document our use of the logos and names as we have hosted junior events, pre Olympic events, and just good old afternoon recreational activities. In fact, it seems to me such a claim is downright fraudulent. I will help. I cannot spend any more money on Laser game management / politics. The definition of services includes this phrase several times: "Organizing and conducting sporting events for the purpose of helping high school seniors earn a college scholarship in their respective sport." What country are they talking about? I assume USA because this is a filing with the US Trademark Office. But the Inter-Collegiate Sailing Association (ICSA) which is the governing authority for sailing competition at colleges and universities throughout the United States does not allow competitors to receive scholarships or financial aid based on sailing ability. So either Rastegar doesn't know this, or he is planning to use the Laser trademark to organize and conduct sporting events for the purpose of helping high school seniors earn a college scholarship in their respective sport, for sports other than sailing. I noticed the same thing but haven't a clue what he is trying to accomplish. The specimen he submitted as proof of his use of the mark is for SailLaser, which I believe in not in the US. However, it is a legitimate use of the mark that he does have control over, as opposed to his previous attempt and claim that an NOR of a California event constituted his use of the mark. This just seems to be an attempt to legitimize his claim for using the mark in connection with running regattas. 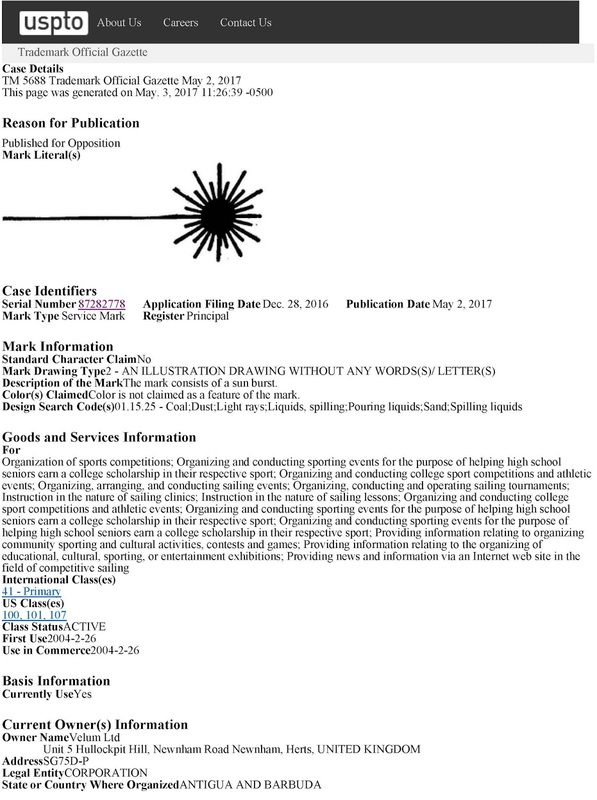 And if Rastegar gets the exclusive right to use the Laser trademark for "providing news and information via an Internet web site in the field of competitive sailing" does this mean that laser.org and all the US Laser district websites would have to stop using the starburst logo or negotiate permission from Rastegar to use it? It does beg the question doesn't it? Surely, he would not be so stupid because if he pushed things that far, all the class has to do it change the name of the boat and class and he's holding an empty bag. I just wonder if the ILCA is already paying some sort of licensing fee and this is just an excuse to further tie their hands on whatever matter he chooses. I still think Kirby had the right idea and no matter how it was perceived, I believe his intentions were in the best interest of the class. Is there any exception in trademark law to allow people to use a trademark when they are clearly referring to the product for which the trademark is registered. For example, let's say that Ford is a registered trademark of the Ford Motor Company, then surely a second-hand car dealer can still advertise that he has a fine, low mileage, one careful owner Ford car for sale. Or can he? Well, first you should take anything I say as speculation with only a hint of a clue about trademarks. I doubt the situation you describe requires an exception. Meaning, the Ford brand is distinct and recognizable and if you buy a car with Ford branding, you can be relatively certain that you are buying a genuine Ford, regardless of who sells it. A used car lot selling a Ford does not dilute the strength of the Ford brand so why would Ford object. The problem arises when the customer can't tell the difference in whether they are acquiring a Ford or a knockoff calling itself a Ford. But we're talking about services and not products with the current Laser issue. I'm not entirely sure what Rastegar intends but it does appear he is setting the stage for something. So is it analogous to Ford Motor Company registering the Ford trademark as applying to the servicing and repair of Ford cars? And then they would have a monopoly of the service/repair business for their cars and be able to charge whatever they like? Maybe it is the reason that charter boats for Croatia are so expensive? No, wrong analogy. Think of services like UPS, FedEx, DHL, etc. They each provide the same service and target the same customers but each has their own branding, reputation, prices, etc. Each is easily recognized by their trucks, packages, uniforms, etc. None of them can prevent the other from providing the same service but, for example, UPS can prevent a newcomer or even FedEx from using a website, packaging, trucks, uniforms, etc. that is confusingly similar to UPS such that a customer might think they have contracted with UPS to deliver something only to find out that it's some mom and pop operation or FedEx that is mimicking UPS' branding. Make sense? When you go to a Laser regatta, can you tell whether LP, the ILCA, or Fred is organizing and running the regatta? At present, not really. We know that usually the local club runs it according to the ILCA class rules. But what happens if LP suddenly says to the ILCA, you can't run a regatta using the Laser starburst logo anymore unless you pay me a royalty fee for doing so? According to an argument made in the trademark opposition that Bruce Kirby filed against LP's previous attempt to secure the logo, LP claims they already have a license with the ILCA. I wasn't aware of that. Does the ILCA pay for that license? Does Rastegar have the right to raise the price of that license? All things I don't know and the ILCA has not shared with us. Maybe it is all taken care of and there is nothing to worry about. I've heard rumors to the opposite effect though. It's just another reason for moving to the RS Aero class where the designer, the builders, the class and the sailors actually work together to help the class grow. Which is pretty much what Doug said at the end of his post about the RS Aero. RS Aero Nationals are coming up in Newport in July. Charter a boat from Marc Jacobi and come and have some fun. Register here.